Keep electronic devices near your bed. This includes alarm clocks, televisions, phones, e-readers etc. These devices have been shown to disrupt sleep patterns and can also produce electromagnetic fields which can disrupt the pineal gland and melatonin and serotonin production. You should also consider drastically cutting down your use of electronics for a few hours before you climb into bed. Alcohol and marijuana are not sleep inducing agents. If you are using any type of drug to help you fall off to sleep you are setting yourself up for even more difficulty in the long run. Study after study bears this out. 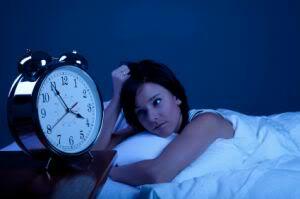 It may take a little time to change this habit but in the end you will get a much better night sleep.